How (not) Fat Are You Really? 4 Responses to How (not) Fat Are You Really? So … it’s later than I thought. 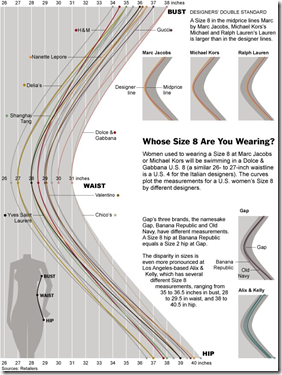 Have you tried to label your brands by average dress cost? My Mama done told me years ago that the more expensive the brand, the bigger the cut – i.e. an expensive store will put a small size onto a fat woman. Typically, a woman starts out thin and poor – those slim teens that fit into anything but shop at Walmart. As a woman ages and broadens out, she buys more expensive clothes but – amazingly – always takes home the same labelled size. I have been a Canadian size 12 (Probably American 8) all my life! Sorry – that smiley face was supposed to American eight). Ooops. It took my text and turned it into a smiley. I mean to say that I am an American size eight – since Canadian sizes are bigger – more of the weirdness of the clothing industry.